The gas giant Jupiter safeguards many secrets crucial to our understanding of the evolution of our solar system. It could also provide insights on how giant planets form and the role these titans played in putting together the rest of the solar neighborhood. NASA’s Juno spacecraft is on its way to reveal those mysteries as the probe is on course for its planned arrival at Jupiter on July 4, 2016. 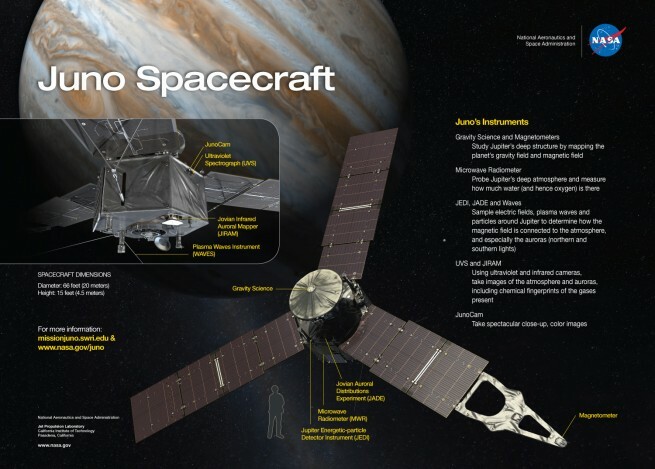 Juno has now traveled 1.5 billion miles (2.40 billion kilometers, or 16.05 AU) since the launch on Aug. 5, 2011, and has another 267 million miles (430 million kilometers or 2.88 AU) before entering Jupiter’s orbit. In Oct. 2013, the spacecraft used a gravity assist speed boost of more than 8,800 mph (about 3.9 kilometers per second) when it flew past Earth. Bolton revealed that now its speed relative to the sun is about 27,000 mph (44,000 kph) and relative to Earth – approximately 41,000 mph (65,000 kph). 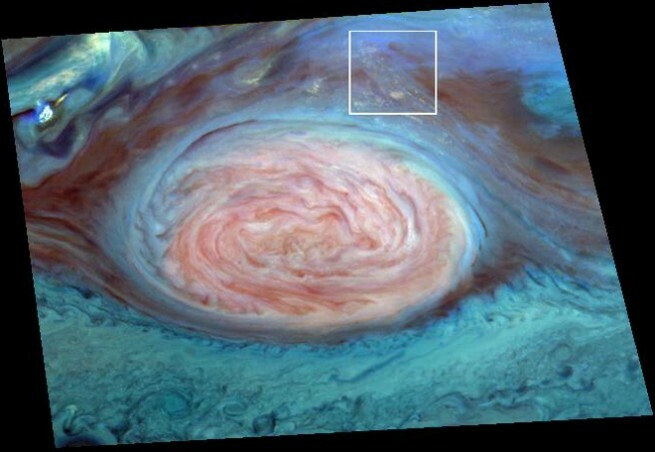 Like in Greek and Roman mythology, goddess Juno, able to peer through the clouds and reveal Jupiter’s true nature, the Juno spacecraft will look beneath the clouds to better understand the planet’s structure and history. The spacecraft will measure the amount of water and ammonia in Jupiter’s atmosphere and find out if the planet has a solid core, resolving the origin of this giant planet and thereby the solar system. 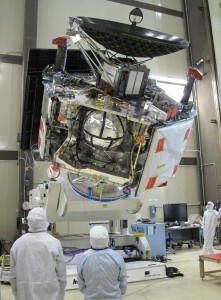 After the arrival at Jupiter, the spacecraft will circle the planet 33 times, from pole to pole, and use its collection of science instruments to probe beneath the obscuring cloud cover. 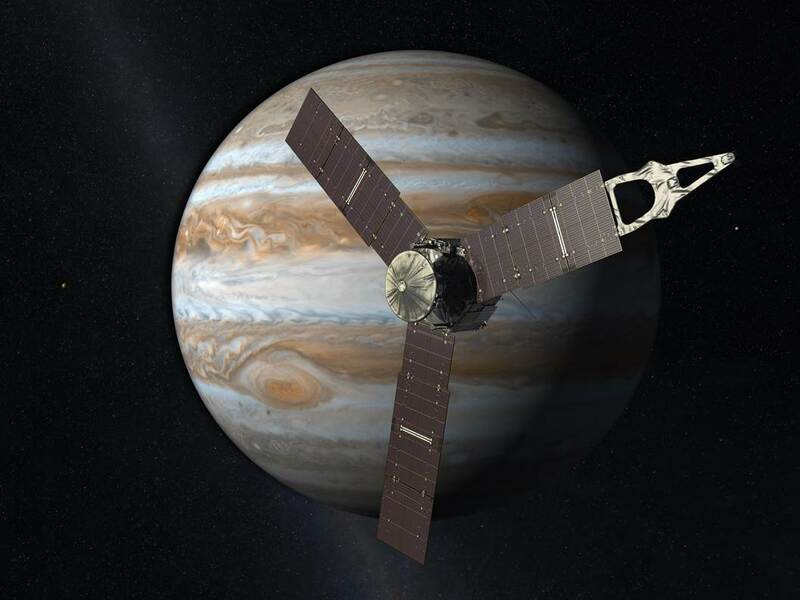 The Juno mission is part of the New Frontiers Program managed at NASA’s Marshall Space Flight Center in Huntsville, Ala. NASA’s Jet Propulsion Laboratory in Pasadena, Calif., manages the mission for the principal investigator Scott Bolton. Oh yay…. the low budget poor man’s JIMO is about to find all the answers…. not. Betcha the current effort to go to Europa will go through its own share of cancellations, thus ending up with another useless flying toaster oven like this. Some of the most awesome moons in the solar system- possibly with subsurface oceans- and we send a robot to look at gas giant clouds. I am so unimpressed. No wonder NASA is criticized. It might be wonderful science but the taxpayer might be more inclined to fund these science missions if they had something to get excited about first. Gas clouds don’t do it; oceans do. Callisto is the only large moon outside Jupiter’s radiation belts where astronauts might land someday. We need to go there with robots. But since it takes five years to get there I guess we will have to wait until someone at NASA pays attention to who is paying them.